An update to a classic wide-angle prime, the Nikon F-mount SP 35mm f/1.8 Di VC USD from Tamron pairs a versatile focal length with a sophisticated optical layout incorporating the company’s VC image stabilization technology for enhanced image quality. 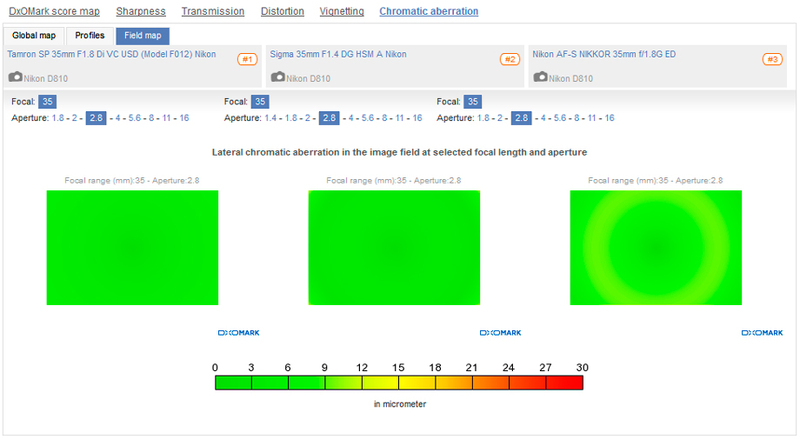 Lens construction consists often elements in nine groups (including two aspherical lenses to reduce chromatic and spherical aberrations for increased sharpness and clarity), one LD (Low Dispersion) element and one XLD (eXtra Low Dispersion) element. 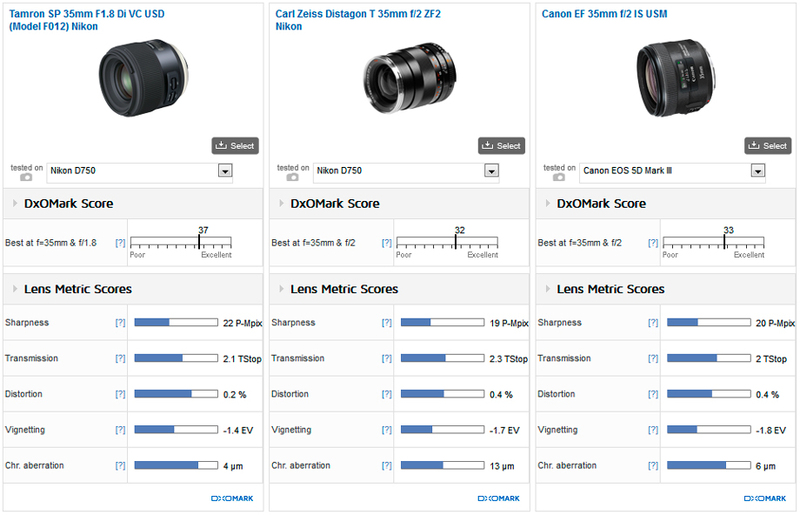 The company says the LD and the higher-grade XLD glass elements optimally compensate for chromatic aberrations (which tend to become particularly prominent in fast-aperture lenses in general), and deliver crystal clear images without any residual color fringing. Tamron’s eBAND and BBAR coatings on this model suppress flare and ghosting for increased contrast and color fidelity, while AF is provided by a sonic-type motor. 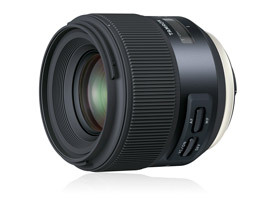 The new Tamron SP 35mm F1.8 Di VC USD (Model F012) Nikon mount focuses to 7.87” (20 cm) and measures 3.17 x 3.10″ (80.4 x 78.7 mm). It weighs 15.9 oz (450.77 g) and is available now for $599.00 (USD). 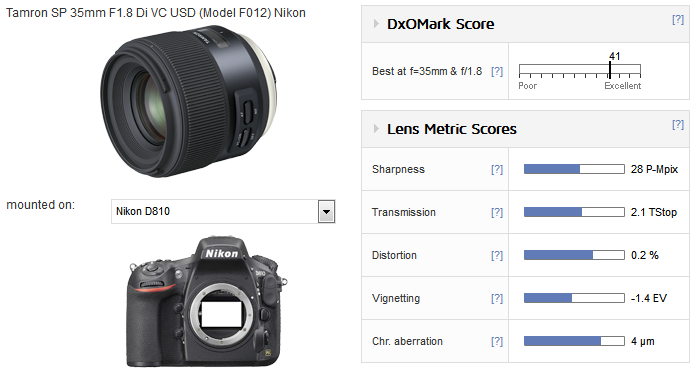 With a DxO Mark lens score of 41 points and a peak sharpness of 28 P-Mpix on the Nikon D810, the Tamron SP 35mm F1.8 Di VC USD (Model F012) Nikon is an exceptional performer. It has very high sharpness even wide open, and with only minor field curvature, it is sharp right out to the corners. Stopping down only slightly improves sharpness in the centers, with most gains made in the outer field. But performance is so consistent throughout the range that it would be hard to tell when photographing 3D subjects. 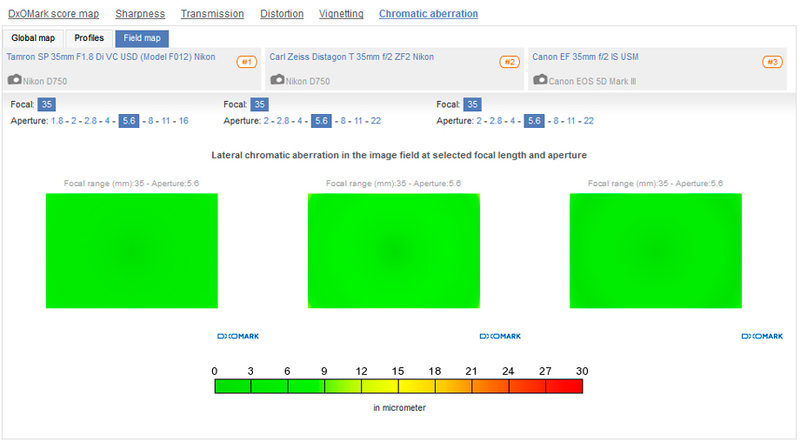 As for the other metrics, distortion is very low, and vignetting at –1.4 EV is pretty typical; however, control of chromatic aberration is exceptional. The only slight downside is the –0.4 EV deviation in transmission from the maximum aperture. Against the high-speed Sigma 35mm f1.4 DG HSM Art, the new Tamron performs at a similar level, but bear in mind that the Sigma is a faster f/1.4 lens and carries a $300 or so premium. Still, from the initial aperture through to f/4, the Tamron is ahead in sharpness, at least from mid-field to the corners on account of the Sigma’s slight astigmatism. The Sigma has slightly higher peak sharpness (at f/2.0), but it doesn’t match the Tamron for uniformity until f/8–f/11. Nikon’s relatively new 35mm f1.8 G ED is no slouch either, but it trails the Tamron wide-open in the outer zones with some field curvature and high levels of chromatic aberration. Stopped down, the Nikkor performs well, with sharpness practically matching the Tamron at every aperture; however, the performance is marred somewhat by a ring of chromatic aberration that persists through to f/16. 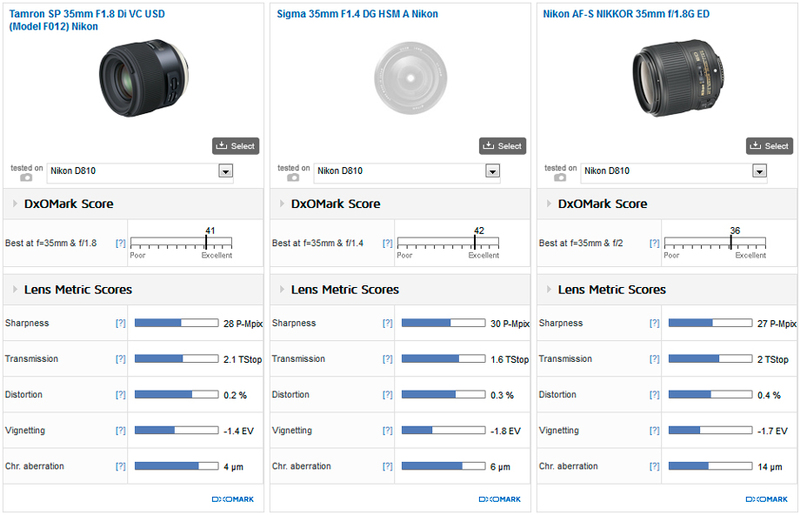 When mounted on the 24-Mpix Nikon D750 for comparison with the Canon EF 35mm f2 IS USM on the 22-Mpix Canon EOS 5D Mk III (we’ve yet to test lenses on the 50-Mpix EOS 5Ds and 5Ds R), we can see that the Tamron compares favorably, outperforming the Canon combination. The overall score is a little higher due in part to the higher peak sharpness and better uniformity (though in fairness, the Nikon sensor has higher resolving power— that is, at least in theory). The Tamron also has slightly lower distortion, vignetting and chromatic aberration, though you can see that the Canon is a very good performer. The Zeiss is also a very good performer, particularly at wider apertures, where it sits between the Canon and Tamron in sharpness across the field. Chromatic aberration is limited to the extreme corners over the first two stops in the Zeiss, but a noticeable ring forms at f/5.6, rather like the Nikkor in the previous comparison, which accounts in part for the slightly lower overall DxO Mark ranking. The Tamron 35mm f1.8 comes close to matching the Sigma 35mm f1.4 in terms of sharpness, and even surpasses it in uniformity at wider apertures, and has lower distortion, vignetting and chromatic aberration. At $600, it’s comfortably more accessible than the Sigma (although you do give up three-quarters of a T-stop); indeed, it’s around the same price as the Nikon 35mm f1.8G ED that it outperforms, particularly with regard to control of chromatic aberration. Add optical stabilization, and the Tamron looks like an attractive option.